An adult choir of men and women enhances and adds beauty to St. Christine Parish’s liturgical celebrations of the Eucharist. Our Adult Choir sings regularly at the Sunday 10:30 Mass from September to June, and at other special liturgies throughout the year. 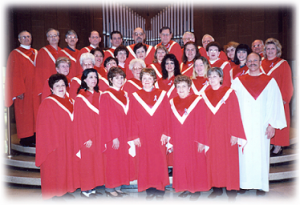 The Choir meets weekly on Tuesday evenings in the Church for rehearsal from 7:15pm to approximately 8:30pm. Any person of high school age or older, who has a love of singing and is blessed with a fairly good singing voice, is encouraged and welcome to join our choir. It provides a wonderful opportunity to enrich the quality of our liturgical celebrations and to join with other members of the parish in an enjoyable ministry.